A chicken pie is a wonderful thing: all savoury, succulent comfort. We've never been fans of gloopy, flour-thickened pie fillings. This one is light and juicy the thin juice deliciously flavoured by the fruity sharpness of the plums and the savoury edge of the leeks. Taken from the Channel 4 series, River Cottage to the Core. Photo: Simon Wheeler. Preheat the oven to 190°C/Gas 5. Joint the chicken and set aside the breasts; you won't need these but they'll make a speedy supper another time. Take the thigh and leg meat off the bones and cut into bite-sized chunks; take care to remove any sinew from the leg meat. Put the chicken carcass into a roasting tray, transfer to the oven and roast for 30-40 minutes until golden brown. Deglaze the tin with a little water then tip everything into a large casserole dish or stock pot. Add the carrot, onion, leek, bay leaves and peppercorns then cover with water. Bring to the boil then simmer gently for 3-4 hours. 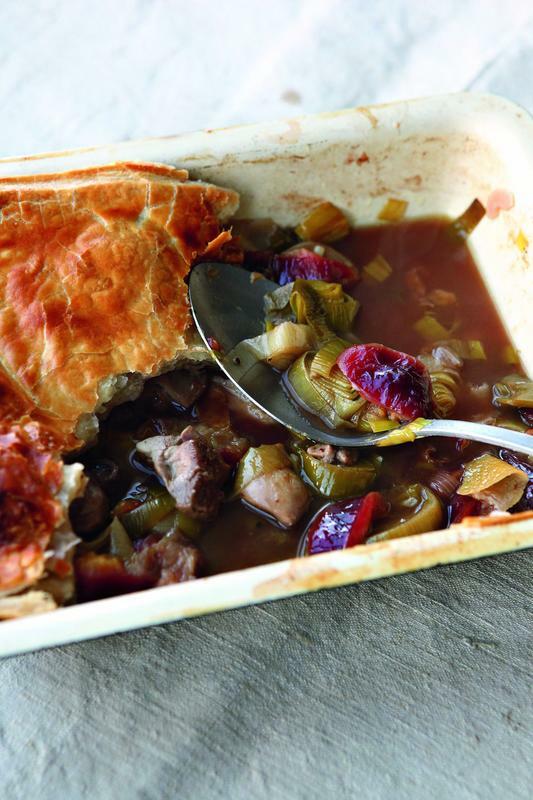 While the stock is simmering away, make the pastry. Toss the fat in the flour and salt until well coated, then add enough cold water to bring the mixture together to form a rough dough. On a well floured surface, roll the dough out to a large rectangle, 2cm thick. Fold the far third towards you and fold the near third back over that, so that you now have a rectangle a third of the size and three times as thick. Give the pastry a quarter turn and roll out into another rectangle, 2cm thick. Repeat this procedure, folding and turning, at least 4 times, preferably 6 or 7. You will need to keep dusting with flour. Fold a final time, wrap in cling film and chill in the fridge for 1 hour. For the filling, heat a trickle of olive oil in a large frying pan over a medium heat and add the chicken. Fry for 3-4 minutes until golden then remove from the pan with a slotted spoon and transfer to a 1.5 litre pie dish. Add the butter to the pan then add the leeks and garlic.